Mampu menganalisis hasil pengamatan observasi untuk merumuskan fenomena dan masalah Fisika. Mampu melakukan analisis terhadap berbagai alternative solusi permasalahan Fisika yang tersedia dan menyajikan simpulan analisis untuk pengambilan keputusan yang tepat. Mampu menunjukkan dan memprediksi potensi penerapan konsep Fisika untuk pengembangan teknologi. Mampu mendiseminasikan secara verbal, grafis, tulisan hasil kajian teoritis dan eksperimen dalam bentuk laporanilmiah. Menguasai konsep teoritis fisika dengan pendekatan klasik dan kuantum yang mencakup struktur, sifat-sifat fisis (mekanik, listrik, magnetik, termal, gelombang, dan optik). Menguasai prinsip dan aplikasi fisika matematika, komputasi fisika dan instrumentasi. Mampu merencanakan, mengatur, dan melaksanakan kegiatan secara mandiri. Mampu berkomunikasi secara efektif dalam suatu tim maupun dalam lingkungan yang lebih luas. Lulusan Program S1 Fisika dapat memformulasikan kembali konsep-konsep fisika serta mampu melakuk ananalisis untuk memecahkan masalah yang menyangkut gejala fisika di alam sehingga memiliki kemampuan dan ketrampilan dalam beradaptasi dengan ilmu dan teknologi yang dibutuhkan dunia kerja. Selain kompetensi utama (mayor) dan kompetensi pendukung, mahasiswa Program Studi Fisika juga diberi kompetensi tambahan yang merupakan bidang keahlian pelengkap yang diambil oleh mahasiswa di luar mayor fisika. Mahasiswa dapat memilih bidang keahlian pelengkap tersebut dalam bentuk program minor atau supporting courses yang tersedia di semua program studi di IPB. The Role of E27-K31 and E56-K10 Salt-Bridge Pairs in the Unfolding Mechanism of B1 Domain of Protein G, Tony Ibnu Sumaryada, Kania Nur Sawitri, Setyanto Tri Wahyudi, Indonesian Journal of Chemistry, Vol. 18(1), 2018. Siti Hasyyati Drahman, Ahmad Beng Hong Kueh, Ahmad Razin Zainal Abidin, Siti Nikmatin, Efficient cumulative breakage distribution and breakage rate computation with minimal experiment intervention incorporating optimal time determination for fine grinding simulation, Powder Technology, Vol. 329, 2018, pp.313-322. Achmad Solikhin, Yusuf Sudo Hadi, Muh Yusram Massijaya, Siti Nikmatin, Shigehiko Suzuki, Yoichi Kojima, Hikaru Kobori, Properties of poly (vinyl alcohol)/chitosan nanocomposite films reinforced with oil palm empty fruit bunch amorphous lignocellulose nanofibers, Journal of Polymers and the Environment, 2018, pp.1-18. Irzaman, Ridwan Siskandar, Nida Nabilah, Aminullah, Brian Yuliarto, Kholoud Ahmed Hamam, Husin Alatas, Application of lithium tantalate (LiTaO3) films as light sensor to monitor the light status in the Arduino Uno based energy-saving automatic light prototype and passive infrared sensor, Ferroelectrics, Vol. 52(1), 2018, pp.44.55. T. Sumaryada, Simulating The Residual Three-body Force in a Small System, Journal of Physics: Conference Series, Vol.988, 2018, 012004. Maddu, A., Deni, I., Sofian, I , Effect of cu doping on structural properties and photocatalytic activity of TiO2nanoparticles synthesized by sol-gel method, Journal of Ceramic Processing Research, 19(1):25-31 · January 2018. K N Sawitri, T. Sumaryada, L. Ambarsari, S.T Wahyudi, 2018 J. Phys. : Conf. Ser. 1011 012084. Siti Nikmatin, Achmad Syafiuddin, Ahmad Beng Hong Kueh, Akhiruddin Maddu, Physical, thermal, and mechanical properties of polypropylene composites filled with rattan nanoparticles, Journal of Applied Research and Technology, vol 15, 2017, pp 286-395. Husin Alatas, Ahmad K Falah, Randika Alditia, Bobby E Gunara, Parameter space for range of bare graviton mass in an FLRW universe based on dRGT massive gravity theory, Annals of Physics, Vol. 387, 2018, pp.299-316. Siti Nurma Nugraha, Irmanida Batubara, Mamat Rahmat, Husin Alatas, Fluorometric based procedure for measuring curcumin concentration in commercial herbal medicines, Optik-International Journal for Light and Electron Optics, Vol. 149, 2017, 125-131. Husin Alatas, Salamet Nurhimawan, Fikri Asmat, Hendradi Hardhienata, Dynamics of an agent-based opinion model with complete social connectivity network, Chaos, Solitons & Fractals, Vol. 101, 2017, 24-32. Molecular docking simulation of mangostin derivatives and curcuminoid on maltase-glucoamylase target for searching anti-diabetes drug candidates, T Sumaryada, AW Roslia, L Ambarsari, A Kartono,, International Conference on Biomedical Engineering (IBIOMED), IEEExplore. Deciphering The Action Mechanism Of Indonesia Herbal Decoction In TheTreatment Of Type II Diabetes Using A Network Pharmacology Approach, Peter Juma Ochieng, Wisnu Ananta Kusuma, Mohamad Rafi,Tony Sumaryada, International Journal of Pharmacy and Pharmaceutical Sciences Vol 9, Issue 3, 2017. Facet-dependent electric-field-induced second harmonic generation in silicon and zincblende, A Alejo-Molina, H Hardhienata, PA Márquez-Aguilar, K Hingerl, JOSA B 34 (6), 1107-1114. R. Sugihakim, H. Alatas , Application of a Boltzmann-entropy-like Concept in an Agent-Based Multilane Traffic Model, Phys. Lett.A, Vol 380 (1-2), January 2016. Husin Alatas, Tony I Sumaryada, Faozan Ahmad, Characteristics of local density of optical states in a tapered grated waveguide at resonant states,Optik-International Journal of Light and electron optics, Vol 27 Issue 5, 2016. Akhiruddin Maddu, Sugianto Arjo, Irmansyah Sofian, A Novel Visible-Light Photodetector Based on Chlorophyll-Modified ZnO Nanoparticles, Photonics Letters of Poland, Vol 8 (3), 2016, pp 85-87. Husin Alatas, Fluxons in superconductor/ferromagnet/superconductor Josephson junction with external current, AIP Conference Proceedings 1719, 030002 (2016); doi: 10.1063/1.4943697, http://dx.doi.org/10.1063/1.4943697 . 2.Siti Nikmatin, Achmad Syafiuddin, Ahmad Beng Hong Kueh, Yohanes Aris Purwanto, Effects of Nanoparticles Filler On Thermo-Physical Properties of Rattan Powder-Filled Propylene Composites, Jurnal Teknologi (Science and Technology) 77: 16 (2015) 181-187. H. Alatas, D. D. Prayuda, A. Syafiuddin, M. Parlindungan, N. O. Suhendra, H. Pawitan, Simple Model for Simulating Characteristics of River Flow Velocity in Large Scale, Int. J. Geophysics 2015, Article ID 520893. Dina Khairunisa, Andari Pratiwi, Ardian Arif Setiawan, Kiagus Dahlan, Agus Kartono, Analysis Of Oral Glucose Tolerance Test Using Modified Oral Minimal Model To Diagnose Of Type 2 Diabetes, Journal of Pharmacy and Pharmaceuticals sciences Vol 7 Issue 8, 2015. Yessie W. Sari, Wilhelmus J. Mulder, Joan P. M. Sanders, Marieke E. Bruins, Towards plant protein refinery: Review on protein extraction potential enzymatic assistance, Biotechnology Journal, 10 (8), 1138-1157, August 2015. Yessie W. Sari, Utami Syafitri, Johan P.M. Sanders, Marieke E. Bruins, How biomass composition determines protein extractability, Industrial Crops and Products, 70: 125–133 (2015). Noor, E., Harmi, L., Maddu, A., Yusron, M, Fabrication of nanogingerol by combining phase inversion composition and temperature,Research Journal of Pharmaceutical, Biological and Chemical Sciences,6(1), 38-47, 2015. Mersi Kurniati,Farah Fahma, I Amalia Kartika, Titi Candra Sunarti, Khaswar Syamsu, Dede Hermawan, Yukie Sato and Masatoshi Sato, Binderless Particleboard From Castor Seed Cake: Effect of Pressing Temperature on Physical and Mechanical Properties, Asian Journal of Agricultural Research 9(4): 180 – 188, 2015. Irzaman, Y Pebriyanto, ER Apipah, I Noor, A Alkadri, Characterization of Optical and Structural of Lanthanum Doped LiTaO3 Thin Films, Integrated Ferroelectrics 167 (1), 137-145, 2015. F. Afriani, K. Dahlan, S. Nikmatin, O. Zuas, Alginate Affecting The Characteristics of Porous β-TCP/Alginate Composite Scaffolds, Journal of Optoelectronics and Biomedical Materials Vol. 7, Issue 3, July – September 2015 p. 67 – 76. A. W. Nuayi, H. Alatas, Irzaman S. Husein, and M. Rahmat, Enhancement of Photon Absorption on BaxSr1-xTiO3 Thin Film Semiconductor using Photonic Crystal, Int. J. Optics 2014 Art. ID 534145, 2014. T. P. Negara, H. Alatas, A. D. Garnadi, S. Nurdiati, Transmission Characteristics of a Microscale Dielectric Slab Waveguide Device with a Deep Groove and an Embedded Metallodielectric Grating at Low Terahertz Frequency,Optik 125 3134-3137, 2014. M. Rahmat, W. Maulina, I. Usman, D. Y. N. Miftah, N. Sukmawati, E. Rustami, M. Azis, K. B. Seminar, A. S. Yuwono, Y. H. Choo, H. Alatas, Development of a Novel Ozone Gas Sensor Based on Sol-Gel Fabricated Photonic Crystal, Sensors and Actuators A 220 53-61, 2014. Sari YW, Alting AC, Floris R, Sanders JPM, Glutamic acid production from wheat by-products using enzymatic and acid hydrolysis, 2014. A Alejo-Molina, H. Hardhienata, K. Hingerl, Simplified Bond Hyperpolarizability Model of SHG, Group Theory, and Neuman Principle, Journal of the Optical Society of America B 31(3) 526-533, 2014. Setyanto Tri Wahyudi, Setia Utami Dewi, Ajeng Anggraeni, Kiagus Dahlan, Akhmaloka, Muhammad Ali Zulfikar, Rukman Hertadi, Simple and Easy Method to Synthesize Chicken Eggshell Based Hydroxyapatite, Advanced Materials Research Vol. 896 (2014) pp 276-279. Husin Alatas,Tony I.Sumaryada , Faozan Ahmad, Local Density of Optical States of an Asymmetric Waveguide Grating at Photonic Band Gap Resonant Wavelength, Proc. of SPIE Vol. 9444 944414-1, International Seminar on Photonics, Optics, and Its Applications (ISPhOA 2014), Sanur-Bali Oct 2014. T. Sumaryada, E.S. Wahyuni, H. Syafutra, H. Alatas, The effect of spectrum range limitation to the efficiency of Al0.3Ga0.7As/GaAs/InP/Ge multijunction solar cells : A simulation case, Proc. of SPIE Vol. 9444 94440M-1, International Seminar on Photonics, Optics, and Its Applications (ISPhOA 2014), Sanur-Bali Oct 2014. Nurullaeli, Agus Kartono, K Dahlan, Mathematical Model of the Intravenous Glucose Tolerance Test Using Modified Minimal Model, Far East Journal of Mathematical Sciences (FJMS), 2013. Agus Kartono, Modified Minimal Model for Effect of Phisical Exercise on Insulin Sensitivity and Glucose Effectiveness in Type 2 Diabetes and Healthy Human; Theory in Biosiences, Theory in Biosciences Springer, 2013. M. Rahmat, W. Maulina, E. Rustami, M. Azis, K. B. Seminar, A. S. Yuwono, H. Alatas, Performance in real condition of photonic crystal sensor based NO2 gas monitoring system, Atmosphere Environment, 2013. Nur Alim Bahmid, Khaswar Syamsu, Akhiruddin Maddu, Production of Cellulose Acetate from Oil Palm Empty Fruit Bunches Cellulose, Chemical and Process Engineering Research, 2013. Muhammad Nur Aidi, Mohammad Masjkur, Siswadi, Sidikrubadi Pramudito, Ardian Arif, Heriyanto Syafutra, Husin Alatas, Irzaman, Phase Transformation of Ba0.55Sr0.45TiO3 Tetragonal to Pseudotetragonal Structures and Arima Model for XRD, International Journal of Statistics and Applications 2013, 3(5): 179-187, 2013. Irzaman , Heriyanto Syafutra, Endang Rancasa, Abdul Wahidin Nuayi, Tb Gamma Nur Rahman, Nur Aisyah Nuzulia, Idawati Supu, Sugianto, Farly Tumimomor, Surianty, Otto Muzikarno & Masrur, The Effect of Ba/Sr Ratio on Electrical and Optical Properties of BaxSr1-xTiO3(x = 0.25; 0.35; 0.45; 0.55) Thin Film Semiconductor, Ferroelectrics, 445:1, 4-17, 2013. T. Sumaryada, R. Sobirin, H. Syafutra, Ideal Simulation of Al0.3Ga0.7As/InP/Ge Multijunction solar cells,Padjajaran International Physics Conference, 7-9 May 2013, AIP Conference Proceedings Vol 1554, Melville New York 2013, pp 162-165e. E. Rustami, M. Azis, W. Maulina, M. Rahmat, H. Alatas, K. B. Seminar, An Integrated Optical Instrumentation for Measuring NO2 Gas Using One Dimensional Photonic Crystal, IEEE Proc. of International Conference on Communication, Information, Instrumentation and Biomedical Engineering, 2012. M. Azis, E. Rustami,W. Maulina, M. Rahmat, H. Alatas, K. B. Seminar, Measuring Air Pollutant Standard Index (ISPU) with Photonic Crystal Sensor based on Wireless Sensor Network, IEEE Proc. of International Conference on Communication, Information, Instrumentation and Biomedical Engineering, 2012. H. Alatas, A. A. Iskandar, M. O. Tjia, Structure Dependent Variations of Group Velocity, Energy Loss and Confinement in a Regular Grated Waveguide, J. Nonlin. Opt. Phys. & Mater., Volume 21, 2012. A. Sulaiman, F. P. Zen, H. Alatas, L. T. Handoko, The Thermal Denaturation of the Peyrard-Bishop Model with an External Potential, Physica Scripta 86 (2012) 015802, 2012. H. Alatas, D. Hermanudin, Semi-Discrete DNA Breather in Peyrard-Bishop-Dauxois Model with Fifth-Order-Approximation Morse Potential, Chaos, Solitons & Fractals, Vol. 45, Issues 9–10, September–October 2012, Pages 1231–1238, 2012. A. Sulaiman, F. P. Zen, H. Alatas, L. T. Handoko, Dynamics of DNA Breathing in Peyrard-Bishop Model with Damping and External Force, Physica D: Nonlinear Phenomena, Vol. 241, ( 19), 1 October 2012, 1640–1647. Lina Karlinasari, Dede Hermawan, Akhiruddin Maddu, Bagus Martianto, Iedo Khrisna Lucky, Naresworo Nugroho, and Yusuf Sudo Hadi, Acoustical Properties of Paricle Boards Made from Betung Bamboo (Dendrocalamus asper) as Building Construction Materials, Bioresources, 2012. Sari YW, Bruins ME, Sanders JPM, Enzyme assisted protein extraction from rapeseed, soybean, and microalgae meals, Industrial Crops and Products, 2012. Why you should take Physics Degrees in IPB ? Physics is the most important science which covers everything from a tiny particles up to galactic structure and universe. Physics is everywhere and physics is needed by everybody. Physics offers a chalenging journey to your mind and trains your brain to THINK analytically and systematically. Once you got trained, you literally can solve any problem in front of you. Physics in Bogor Agricultural University (IPB) is quite unique since it is located in an agriculture and life sciences institution. 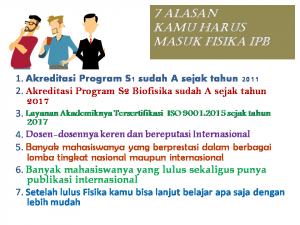 This makes us special, since we can help excell the research of IPB in life and bio sciences and technologies. Our physics faculties (staff) have research collaborations with almost every programs in IPB including agriculture, forestry, bichemistry, chemistry, fisheries, veterinary sciences, and many more. Research in IPB is very diverse ranging from fundamental physics, particle physics, general relativity, soliton, nuclear, computational and modelling, material sciences, bionanocomposites, biomaterials for bone and teeth substitutions, thin film, solar cell, sensors, instrumentation and robotic, real time measurement instrument, non-invasive medical instrument, agent-based model, molecular docking and drug design, molecular dynamics simulation, folding/unfolding of protein, protein-protein interactions, biomass and bioenergy, simulation of drug absorption, simulation of glucose-insulin model, and many more. By taking your degree with us ( Undergraduate program or Graduate program Master in biophysics) you will not just learn the beauty of physics, but also find its wide applicability in life sciences, medical, agriculture and our daily life. Indonesia needs more excellent physicists that understand not just physics but also the problem of this nation in maintaining a sustainable energy, food, technology, health-medicine. IPB is the right place for you to take your physics degrees ! 1. Scientist / Lecturer / Teacher : in National Nuclear Agency (BATAN), Indonesian Sciences Institute (LIPI), National Aeronautics Agency (LAPAN), lecturer at UI, IPB, Jambi University, Jember University UIN Maulana Malik Ibrahim Malang, ITERA, Unindra, UIN Jakarta, various SMAs and SMPs, etc. The Department of Physics Bogor Agricultural University finally has one of its Faculties reach the Full Professor Academic Rank. Hopefully this will accelerate the progress and performance of Department of Physics and also motivates other Faculties to reach the same goal in the future.